With SAP SuccessFactors Time and Attendance Management by WorkForce Software you can streamline compliance with wage and hour laws and leave regulations, optimize employee scheduling, and give managers the visibility they need to make more strategic workforce decisions. Why SAP Time and Attendance Management by WorkForce Software? Because it combines powerful tools for time and attendance management, absence compliance tracking, and advanced scheduling in a single cloud-based suite. It helps you lower labor costs and improve business execution – and it seamlessly integrates with SAP ERP and SAP SuccessFactors Employee Central. Help managers quickly generate employee schedules and keep costs down. Allow employees to request time off, view work schedules, swap shifts, and more. Use configuration instead of custom code to address complex needs – so it’s easier to make changes and keep up with new regulations. Give employees direct access to the data and tools they need through SAP SuccessFactors Employee Central. Ensure maximum system performance and security with minimal demand on your IT staff. 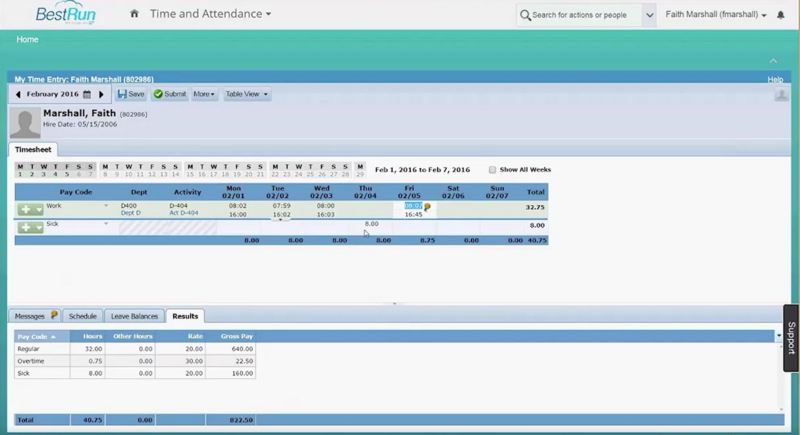 Capture accurate time and labor data and feed it directly to SAP SuccessFactors Employee Central Payroll – for faster accrual payroll processing. Automate complex pay rules for your entire workforce – for all employee types and all business locations. Simplify all aspects of leave management – from the initial request through to the employee’s return to work. Provide an accurate view of current and projected time-off balances, and prevent time-off leakage. Create a complete view of employee labor activities and gain insight to strategically manage workforce costs, all while integrating seamlessly with SAP SuccessFactors Employee Central.